This Demonstration illustrates the working of an astronomical clock. To visualize the movement of the Sun and Moon on the celestial sphere, astronomical clocks use stereographic projection. The Earth's projection is at the center of the clock, surrounded by the concentric circles of the Equator and the tropics. The blue ring is the projection of the ecliptic with the Sun and the Moon. The ecliptic ring is divided into sectors defining the four seasons and the 12 months of the year. The red circle is the projection of the horizon dividing the celestial sphere into day and night. 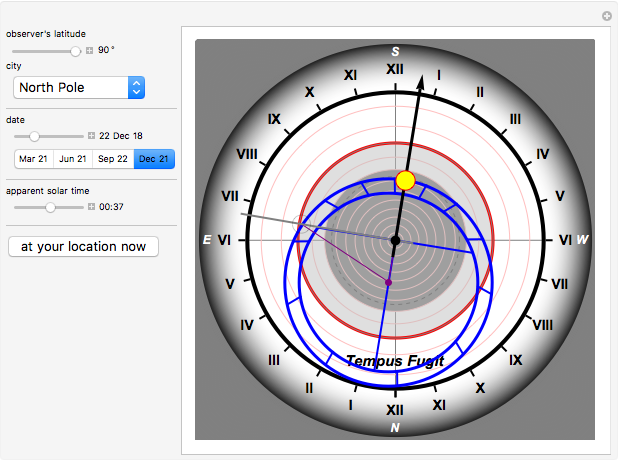 Change the date to show the position of the Sun and the position and phase of the Moon for that day. 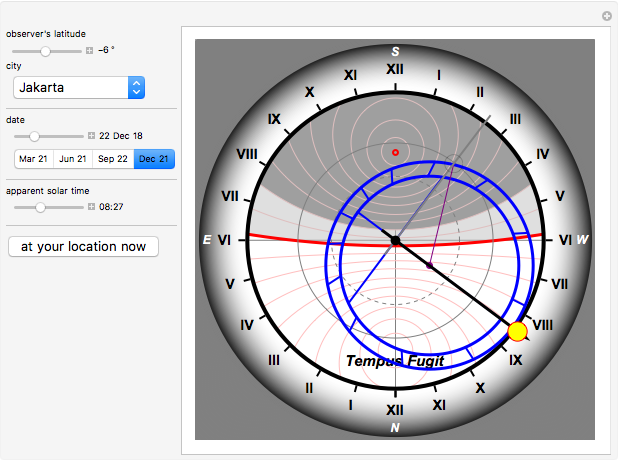 Change the time to move the ecliptic to its corresponding position around the Earth. Setting the observer's latitude moves the horizon and defines the times when the Sun and Moon will rise or set. A detailed explanation of the astronomical clock in Prague, which inspired this Demonstration, can be found in . The dial of the astronomical clock features several circles that are the stereographic projections of circles on the celestial sphere and of the supposed circular orbits of the Sun and Moon around the Earth. The Earth is supposed to be at and the projection plane is . Since the stereographic projection of a circle on the sphere is a circle in the plane, it is sufficient to calculate the centers and radii of the projected circles. The projection of the Earth is at the center of the clock. The three concentric circles around it are the projections of the Equator and the tropics. The largest circle just under the Roman numerals is the Tropic of Cancer. The dashed smallest circle is the Tropic of Capricorn and the middle circle is the Equator. These circles are fixed and stay fixed on the dial. The red circles are the projection of the almucantars, that is, the lines of fixed solar altitude on the celestial sphere. The fat circle of altitude zero is the horizon. This circle divides the celestial sphere into day and night. The smallest tiny circle is the zenith and represents altitude 90°. The other almucantars are at 9° altitude intervals. The dark disk and circle at altitude define the area of complete darkness or astronomical night. The almucantars are only dependent on the latitude of the observer. The projection of the ecliptic is represented by a ring of two concentric blue circles. This ring revolves around the center of the clock, showing the Earth's rotation around its axis. Its eccentricity to the center of the clock is the result of the Earth's axial tilt of 23.45°. Four spokes divide the ecliptic ring into four unequal parts representing the four seasons. The shortest spoke cuts the ecliptic at the winter solstice, the longest at the summer solstice. The two other spokes of equal length cut the ecliptic at the equinoxes. The ring is further divided into 12 sectors marking the months of the year. The Sun travels counterclockwise along the ecliptic ring during one year. While crossing the horizon it will rise and set in the East or West depending on the observer's hemisphere. East is to the left of the clock, West is to the right. South is at the top of the clock and North is at the bottom. The Moon travels along the ecliptic ring at a higher speed and goes to different phases depending on its position in relation to the Sun. The Prague clock uses gears with 379 and 366 teeth and hence gets lunations. In this demonstration, the Mathematica expression MoonPhase is used to get the illumination fraction of the moon used for the moon's display on the dial. Apparent solar time can be read by the Sun hand on the 2×12 hour Roman numeral dial. The division between am and pm hours depends on the observer's hemisphere. 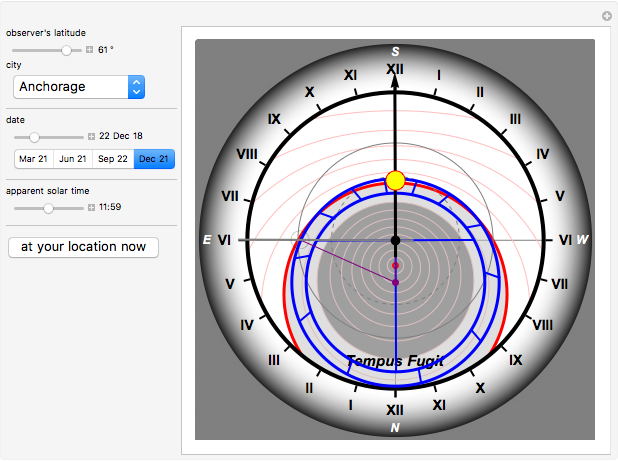 For this Demonstration, solar time is computed from the local (clock) time and depends on the observer's longitude, time zone, and the use of daylight saving time. The approximate date, or at least the month, can be read by estimating the sector of the ecliptic ring covered by the Sun hand. V. Sedlá&ccaron;ek. "The Astronomical Clock in Prague (A Detailed, Illustrated Description)." Agentura ProVás. (Aug 2010) www.plakatovani.cz/english.